This exhibit is permanently dedicated to the memory of Clifford Rueff[1/5/1922-8/26/2007], Senior Service Technician for Friden/Singer/TRW out of the Denver, Colorado office. The Friden 132 was the successor to the groundbreaking and very successful Friden 130. 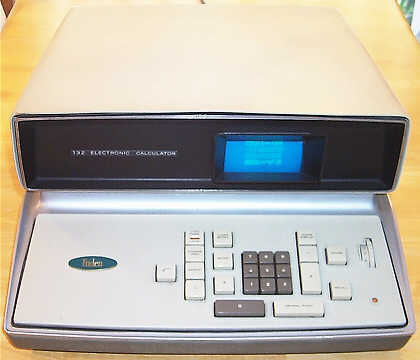 The 130 is historically considered the first commercially-available solid-state desktop electronic calculator. 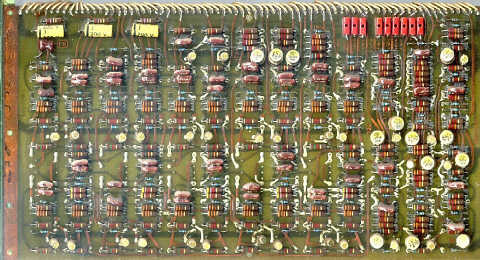 The 132 added to the features of the 130 by adding a single-key automatic square root function, additional fixed decimal point settings, and a modification to the Reverse Polish Notation (RPN) stack logic that made the top register in the stack automatically duplicate itself into the 3rd register when the stack popped, providing an automatic constant feature. These additional features made the 132 more suitable for scientific applications where the square root or constant operations were frequently needed. The exhibit on the Friden 130 goes into great depth as to the development and history of the machine. For this reason, the historical aspects of the development won't be detailed in this exhibit. Readers interested in the wonderful story of the development of the 130 should visit the Friden 130 exhibit. The EC-132 was introduced to the Friden sales force at the company's annual sales meeting, in a morning session on April 7, 1965. Although the 132 provided additional functionality versus the 130, the overall architecture and design of the 132 was fundamentally very similar to the 130. The general architecture of the 130 consisted of a series of interconnected counters connected to a magnetostrictive delay line for working register storage, combined with hardwired sequencing logic to control the operation of the machine. The basic design was carried over with little change to the 132. The main changes to the logic involved modifying the sequence control circuits to implement the square root algorithm. Like the 130, the design of the 132 was elegant. 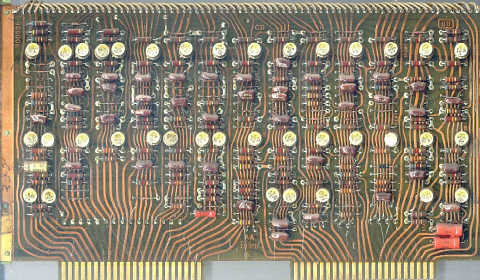 And also like the 130, the genius behind the design was Friden's electronic calculator guru, Robert Ragen. Like the Friden 130, sometime in the latter part of 1965, Friden engineers realized that some design changes could be made to remove one of the four counters in the machine, simplifying the logic (and thus reducing parts-count and cost). Friden EC-132's prior to serial number 3902 utilized the original four-counter architecture of the Friden 130. Machines from serial number 3092 and beyond had changes to the logic to eliminate the "B" counter, making the machines "three counter" architecture machines. 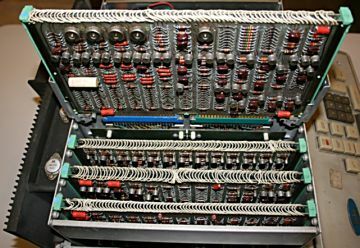 The algorithm that Friden used for for calculating square root was implemented mechanically in some of Friden's most advanced electromechanical desktop calculators of the late 1950's, such as the Friden SRQ. These mechanical wonders were able to automatically extract square root through an interesting twist on the method used to perform division, utilizing only a bi-directional counter, an accumulator, addition, subtraction, and shifting. This same basic method of extracting square roots is well-suited to an electronic implementation, with some twists. Other square root methods require more complex math operations such as multiplication and division, which results in much more complicated logic. The square root algorithm is based upon the fact that the square of a number n is equal to the sum of n odd numbers beginning at 1. As examples, the square of 5 is equal to 1+3+5+7+9 = 25; and the square of 7 is 1+3+5+7+9+11+13 = 49. Conversely, the square root of a perfect square is the number of odd numbers in the summation that are added together to match the square. The method used in the 132 was patented by Singer as US Patent number 3,526,760. For a detailed description of the exact method used, see the document Friden 132 Temporary Service Manual - Square Root Mathematics (PDF, 3.3MB), published August 1, 1965, as part of a prelimiary service manual for the Friden 132 calculator. This original Friden document is made possible through the generous donation by the sons of Mr. Cilfford Rueff (Eugene, Christopher, and Roger), who was a Friden/Singer/TRW service technician for many years. 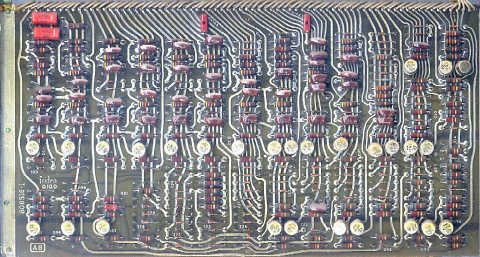 The logic circuitry of the 132 is contained on a total of eight circuit boards (one more than the 130), each of which is approximately 12 by 5 inches in size. 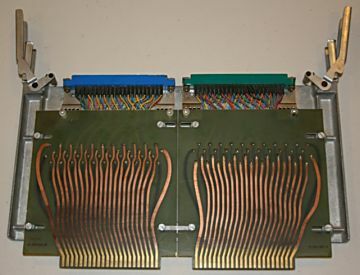 The boards are grouped together in twos, with each set of two boards connected together by a whole bunch of individual wires that interconnect the boards across their tops. A plastic fixture positioned in between the two boards keeps the boards together, stiffens the two board assembly, and doubles as a guide for inserting the cards into the chassis. A conformal coating covers the interboard jumper wires to keep them in place. In each set of boards, one board has edge connector fingers on it that allow the board set to plug into the backplane connectors. 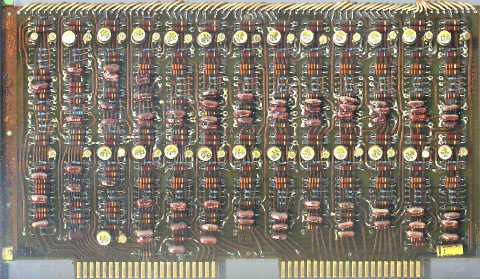 The backplane connector slots are arranged at different locations so that it is impossible to plug the wrong boardset into the wrong slot. For servicing, Friden created a special adjustable extender card. The extender adjusts to the four different spacing positions between the two edge connectors to allow the extender to plug into any of the slots in the backplane. The majority of the transistors used in the logic are made by Texas Instruments, and are Germanium devices, primarily 2N1304's and 2N1305's. 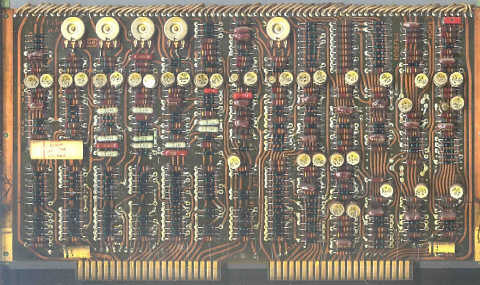 A total of only 324 transistors make up the digital portion of the logic of the 132, a testimony to the efficiency of the design. A small number of additional transistors are used in the power supply, CRT deflection amps, and read/write amplifiers for the megnetostrictive delay line. The logic utilizes diode-resistor gates (AND and OR gates), with transistor-based inverters, buffers, and flip-flops. 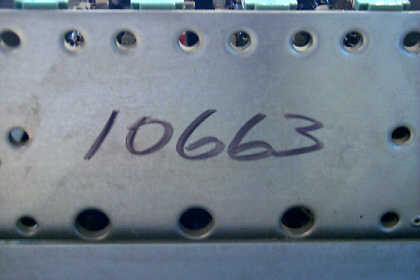 Date codes on transistors in the exhibited machine (Serial #10663) range from late '64 through early '65. 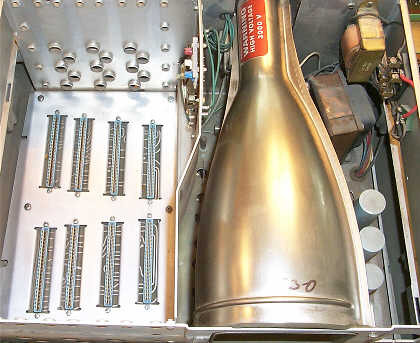 Like the Friden 130, there is a small circuit board mounted to the aluminum chassis separating the card cage from the CRT subsystem that contains the deflection amplifiers for the CRT display. 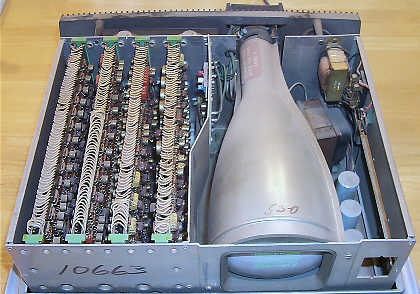 The power supply, consisting of the low-voltage supply for the logic of the machine, and a high-voltage supply for driving the CRT, is contained on a circuit board mounted under the CRT. The logic supply uses large filter capacitors to smooth the rectified supply from the main transformer, and transistor regulation to keep the logic supplies at the right voltages. A small 6.3V transformer provides the heater supply for the CRT. The high voltage power supply uses a capacitor-diode voltage multiplier circuit that produces the high voltage (roughly 3KV) for the Westinghouse type 5DEP1 electrostatic deflection CRT tube. The 132 uses a similar 4-level RPN stack architecture to the earlier 130, with all four stack registers visible on the display. An added feature of the stack on the 132 is that the top (fourth) register automatically duplicates itself to the third register when the stack is popped. This makes permanent constants possible. By pushing the desired constant into the top register, the constant is automatically duplicated upon each math operation. For example, to repeatedly multiply by two, generating powers of two, one need only enter "2", followed by three depressions of the [REPEAT] key, followed by as many depressions of the [X] key as desired. The 132 uses the same display rendition as the Friden 130, with digits rendered in seven segment form. 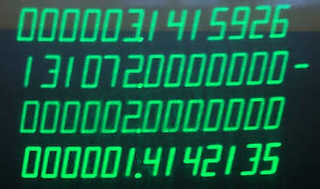 The sign of the number is displayed as a "-" to the right of the number if the number is negative. The 132 offers more decimal point settings than its predecessor, allowing the decimal point to be positioned at any place within the display registers. A 14-position rotary knob on the keyboard panel selects the decimal point location from 0 to 13 digits behind the decimal point. The 132 adds a small pilot lamp to the keyboard panel that lights up orange (via a small neon lamp) to indicate that the machine is turned on. The reason that power indicator was added is that while calculating, the Friden 130/132 blank the display. If a division by zero occurred, the machine's display would blank out, and stay blank. Apparently this caused problems, as sometimes users would forget to turn off the calculator, and put a dust cover over the machine. Doing so with the power on would cause heat to build up, potentially causing overheating of various components in the calculator, leading to damage. The addition of a power indicator lamp made such an occurrence much less likely. The 132 uses the same mechanically encoded and interlocked keyboard design of the 130, with the only change being the addition of the [√] key. During operations, the numeric entry and operation keys are physically locked out from being depressed. There are one subtle change in the keyboard nomenclature between the 130 and the 132. The [CLEAR ALL] key of the 130 is designated as [CLEAR DISPLAY] on the 132. Even though the function is the same (the stack is cleared) on both machines, it seems that "CLEAR DISPLAY" was more clear, as the memory register is not cleared by operation of this key, while "CLEAR ALL" may have implied that the memory register was also cleared. Operation of the 132 is identical to that of the Friden 130, with the exception of the added square root functionality, and variation in stack operation. Numbers are loaded into the bottom register of the stack as they are entered. The [ENTER] key used to complete the entry of the first number in a calculation. When the [ENTER] key is pressed, the number entered is automatically decimal aligned per the setting of the decimal point location. If the entry of the number results in an inability to perform decimal alignment, the [OVER FLOW/LOCK] indicator lights, and the keyboard locks. Pressing the [OVER FLOW/LOCK] key releases the keyboard, allowing operation to continue with the truncated number. The [CLEAR ENTRY] key can be used to clear the bottom register in the stack should an error be made in entry. The [REPEAT] key duplicates the number at the bottom of the stack by pushing the number in the bottom register in the stack up one, then duplicating it in the bottom register in the stack. This repeat function makes squaring an easy operation, the operator need only enter the number to be squared, press the [REPEAT] key, and the [X] key. The [CHANGE SIGN] key toggles the sign of the number in the bottom of the stack. The standard four math keys perform their respective operations on the bottom two numbers of the stack, with the result ending up in the bottom register. The square root function first pushes the stack up, duplicating the bottom number on the stack into the second register. Then, the square root of the bottom number in the stack is calculated, with the result taking its place in the bottom register of the stack. The 132 also features the same store/recall memory functionality of the 130. The [STORE] key copies the bottom register of the stack into the memory register, popping the stack downwards. The [RECALL] key pushes the stack up, then copies the number in the memory register into the bottom register in the stack. Like the 130, the 132 provides 13 digits of capacity. The particular Friden EC-132 presented here is serial number 10663. Friden apparently felt it necessary to put the serial number in a number of places on the machine, likely for theft recovery reasons, and perhaps for internal tracking of parts as they moved through the production line. The model and serial number is also stamped into the bottom of the chassis. The serial number is also hand-written with a permanent marker on the front plate of the chassis, on the inside of the top cover, and also on the aluminum housing of the magnetostrictive delay line. The 132 operates at the same fundamental calculation rate as the 130, with the "all nines divided by one" benchmark taking about 2 seconds to perform. Square root operations vary in the time taken to calculate, ranging from 0.1 seconds for simple arguments (for example, calculating the square root of 4) to up to 2.5 seconds for more complex square roots (e.g., square root of 9999999999999). During all math operations, the display is blanked. The display is immediately restored once calculation completes. The 132 still has the same weakness as its predecessor in terms of not trapping attempts to divide by zero. When attempted, the display will blank, and not return until the [OVER FLOW/LOCK] or [CLEAR ENTRY] key is pressed, which returns the calculator to normal operation. The 132 also doesn't know that taking the square root of a negative number is an illegal operation. The machine simply ignores the sign of the argument, returning the result as if the argument was positive. Friden had developed automatic testing equipment for its electro-mechanical calculators, which streamlined the testing of the machines as they came off the assembly line. An impromptu discussion between a couple of men in Friden's Service Department during the summer of 1966 led to the idea of doing something similar for the electronic calculators. After a few weeks of experimentation, a basic prototype was completed. The idea quickly gained traction after the prototype was demonstrated, and a production run of the robotic tester, which was nicknamed "Granny Goose" by the engineers that worked on it, was begun. The robot testing machine has an electronic controller (the unit with all of the black knobs on it in the photo above) with a test program fed to it by a Friden punched paper tape reader(located in front of the controller unit). The controller read the program sequences from the tape, and actuated solenoids mounted on a fixture that fit over the keyboard of a Friden 130 or 132 calculator, which would press the keys to enter the test sequences. An operator would manually verify that the calculator had performed the proper function by observing what was on the display of the calculator under test. Test routines were written such that the testing could expose and identify specific flaws in the calculator. The operator had means to select different test programs to exercise specific parts of the calculator, to further help isolate problems. Each controller could run up to three solenoid fixtures, which were daisy-chained together using special cables. 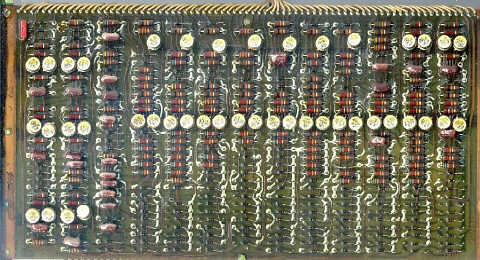 Prior to the development of this robotic device, testing of Friden's electronic calculators was performed manually, by humans who would run the machine through a diagnostic process by hand. These robots dramatically increased the accuracy of pre-shipment testing, and also made the testing process much faster. The first robotic testers were put in operation in Friden's assembly plant in January of 1967, and over time, these devices were set up in Friden's field service centers around the US. 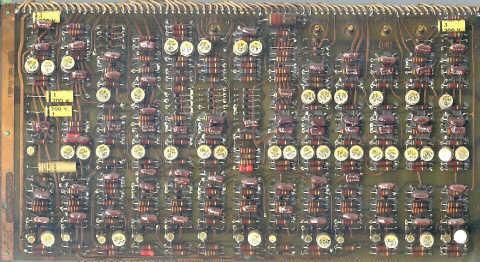 The Friden 132 calculator exhibited here was acquired from the original owner of the machine, Mr. Larry Gugliotta. Mr. Gugliotta owned the calculator since November, 1965, when the machine was given to him as a gift by his father for his 10th birthday. Clearly, Larry's father was a very forward-looking man, predicting that the future would be bright for those those who had a strong basis in mathematics. At the time the price of this machine was around $2000, a large sum of money in those days, but certainly a worthwhile investment toward his child's future. The machine was purchased from an office equipment supplier in Chagrin Falls, Ohio, a suburb of Cleveland. Over the years, the machine made a number of moves, including a move to Houston, Texas in 1975, then to New Mexico in 1977. Through all of the moves, the machine was treated with great care. The machine remained fully operational through all of its adventures in time, a great testimony to the reliability of the design, and the care given to the machine by its owner. Mr. Gugliotta contacted the Old Calculator Museum in late April, 2003, expressing an interest in the museum acquiring this prized sentimental posession so that the machine could shared with others, and live on as a permanent part of the museum. The Old Calculator Museum offers sincere thanks to Mr. Gugliotta for the opportunity to acquire this wonderful artifact. The machine was very carefully packed for shipment from New Mexico to the museum's home in Oregon. Upon arrival, everything was intact, with no signs of damage, including the delicate CRT display tube. Upon powering up, the display came up clear and clean, all zeroes as expected. However, entering any digits immediately caused the display to go blank, with the only way to restore the display being to turn the machine off, then back on again. Definitely a setback. A visual inspection was performed, and it was found that a lock nut on an adjustment potentiometer for the delay line circuitry had come loose, allowing the adjustment setting to move. With some tweeks to the adjustment, the machine became much more stable, with numbers being able to be entered, and the stack manipulated. The machine was reassembled, hoping that this was the root of the problem. However, after more testing, that proved not to be the case. The machine would add and multiply flawlessly, but subtraction, division, and square root (which relies heavily on subtraction) delivered incorrect answers, or in some cases, locked up the machine. More investigation was necessary. As it turned out, the problem was simply a matter of the effects of time. 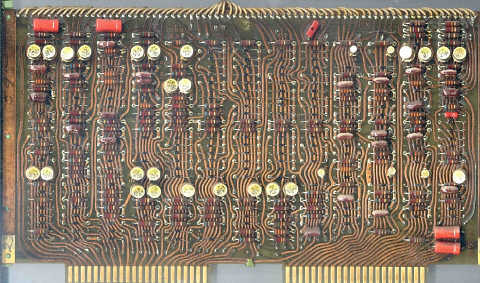 All of the circuit boards were removed, and it was found that there was a small, but significant amount of oxidation on the circuit board edge card fingers. All of the edge connector fingers were carefully cleaned, as well as the contacts on the connectors that the boards plug into. Upon reassembly, the machine was restored to full functionality. 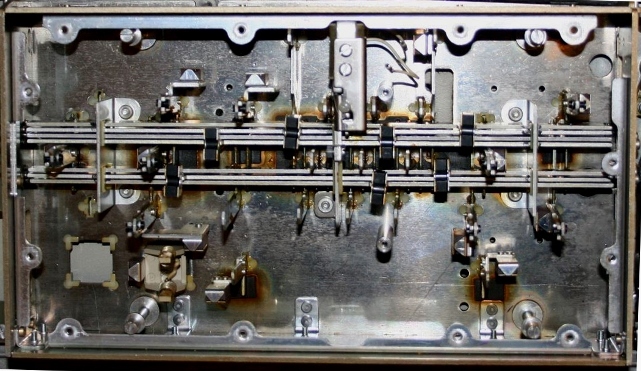 The problems that the machine had were attributable to the motion that occurred in shipping; loosening the delay line adjustment lock nut, and jiggling of the circuit boards aggravating the oxidation on the edge connectors to cause a failure. Fortunately, these issues were easily solved once discovered! In January of 2010, the museum was fortunate to receive another Friden EC-132 calculator from Mr. Pat Scandalis. Mr. Scandalis attended Cal Poly San Luis Obisbo (California) beginning in 1976. 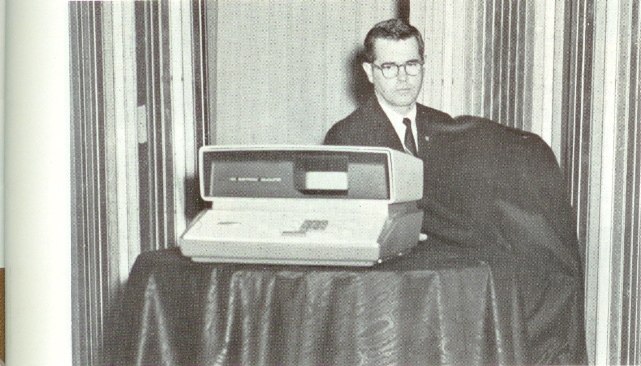 At the time, he couldn't afford his own calculator, so to help with his Physics calculations, he used the Friden EC-132 (Serial #11945) in the physics computer lab at school. Even though the machine was around 10 years old, it was still in active use at the school, and Mr. Scandalis found it to be a great tool for working through his calculations. In December of 1978, the Friden was to be "put out to pasture" and was put up for sale for $25.00. Mr. Scandalis bought the machine, mostly out of affection for serving him so well in his studies. He kept the machine through the years, including having it in his office when he worked for Apple Computer from 1990-1993. His office was frequently visited by engineers who would love to come by to see this "dinosaur" in operation. In late 2009, Mr. Scandalis contacted the Old Calculator Museum to see if the museum would be interested in acquiring the machine. Mr. Scandalis arranged for the machine to be professionally packed and shipped to the museum, donating the machine itself, as well as the costs of packing and shipping. The museum is deeply appreciative of Mr. Scandalis for this donation. Other than requiring some minor display adjustments, the machine operates perfectly to this day, over 40 years from when it was new.